Chelsea: Begovic, Azpilicueta, Terry, Zouma, Baba, Loftus-Cheek, Fabregas, Ramires, Willian, Pedro, Costa. Aston Villa: Guzan, Hutton, Richards, Lescott, Richardson, Gana, Westwood, Grealish, Ayew, Gil, Gestede. A very simple and much-needed win for Chelsea, who never got out of second gear. Villa were woeful. They are in trouble. Chelsea change. Loic Remy on for Willian. Diego Costa nearly has the final word but Brad Guzan just nips in ahead of him to palm away Ramires' cross. Before that, Costa ran into the back of Ashley Westwood, sparking another little tussle. He just can't stay away from bother can he? This game was done and dusted a long time ago. 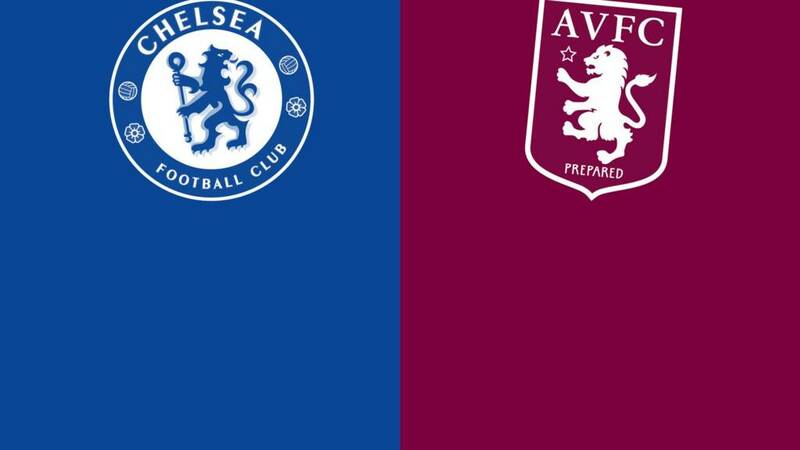 Villa are resigned to their fate, Chelsea are seemingly happy with 2-0. Let's just get these last few minutes rattled off and get on home. Eden Hazard gets a little cameo, coming on for Pedro, who has been quiet this half. Diego Costa does a superb job for his team, holding the ball up and winning a free-kick off Micah Richards, who gets in a tangle with the striker and chests him down. It looks like there was a flailing arm from Costa that caught the Villa man. I wouldn't be confident to say it was intentional, though. But this is Costa and his reputation follows him. Finally, some singing from the home fans. It is only a brief rendition of a song but it shows there is still life out there. The home team greet the rise in noise by creating a great chance as Willian's pass finds Cesc Fabregas is space in the box for a shot that flashes a yard past the post. Chelsea are heading for victory here but you wouldn't know it. The stadium is very quiet. Willian is booked for tripping a Villa player just inside the Chelsea half. Good work from Chelsea denies Joleon Lescott as a number of bodies throw themselves in front of the ball as it drops at the defenders feet following a free-kick into the box. The Blues have not had to defend much this half but they did that superbly. It could have been three. Villa gift the ball to Willian again but this time, unlike the opening goal, Diego Costa cannot finish a low cross with Brad Guzan diving out to claim. Watching this, you fear for Villa this season. This definitely won't do for Villa, who make another change. Jordan Ayew departs and Adama Traore is introduced. This won't do for Villa, though. They make their first change as Jordan Amavi comes on for Kieran Richardson. There was a time when Chelsea would have gone for the jugular in these circumstances. The Blues are not in that place right now, though. 2-0 will do just fine for Jose Mourinho's men. Villa look done. Pedro is found on the right corner of the box in acres of space, but his shot flies past the far post. Soon after, Cesc Fabregas' cross is met by the head of Diego Costa in the box but not with the power to test Brad Guzan. That could well be that. Cesc Fabregas picks up the ball and floats a pass into the box for Diego Costa, who brings the ball down with his chest turns well and then fires a low shot that wasn't destined for the goal until the heel of Alan Hutton deflects the ball past Brad Guzan. Long way back for Villa now. The first card goes to the Villa man as he slides in to the back of Ramires near the touchline. Jack Grealish with an effort for Villa - the first of the half - which flies past the far post. Chelsea make a change at the break as Nemanja Matic comes on for Ruben Loftus-Cheek. Apparently this is tactical. It's a shame as the youngster did quite well. Hopefully, Matic will last longer than 15 minutes this time. Joleon Lescott is number 16 on this goal map. His marker is black and yellow but it should probably be bright red from the embarrassment of allowing Willian to nick the ball and Costa to score. That is your lot for this half. Hardly a classic but Chelsea have the lead and in their current predicament that is all they will care about. Villa are seemingly on a suicide mission with the amount of times they have given the ball away. Stamford Bridge is eerily quiet. Maybe a hot brew at the break will liven them up? Guess what? Villa give the ball away again in their own half but Ruben Loftus-Cheek can't latch on to Diego Costa's pass into the box. One minute of time is added to the half. What are Villa doing? Again, their defence gift the ball to Diego Costa, who drives in to the box but is muscled out by a combination of Joleon Lescott and Kieran Richardson. The striker drops to the floor looking for a penalty but the referee isn't fooled. Mike: Not for the first time this season Brad Guzan proves he is not a Premier League keeper. He's ruined a bright Villa start. Villa can't just sit back now. They have to create something. Ashley Westwood almost does with a deflected shot from the edge of the box that Asmir Begovic saves. Jack Grealish then gets top the byeline but can only drive his low cross into the hands of the Chelsea keeper. "I don't know what Brad Guzan was doing. You have to clear your lines. Any mistake and Chelsea will pounce on it, even with the poor run of form they're on at the moment. "Villa had a chance five minutes before where Rudy Gestede should have scored. They didn't and now they've been punished." "This is a great test of Tim Sherwood's managerial ability. At half-time will he rant and rave? Before conceding, his team was doing very well and was unlucky not to be in front. What does conceding that goal do to morale?" Villa are losing their discipline. Micah Richards knocks down Pedro for a free-kick on the left of the box. Willian curls it in to the box but also straight into the hands of Brad Guzan. "Jose Mourinho couldn't afford to take Terry and Ivanovic out of the team at the same time. Those two players, who may both be lacking pace, contribute in other areas. Mourinho is having the manage a team that's getting old." A goal, gift-wrapped by Villa and gratefully received by the majority in Stamford Bridge. For the third time, Villa give the ball away in a dangerous area as Brad Guzan's pass is not controlled by Joleon Lescott and stolen by Willian, who drives in to the box before setting up Costa for an easy finish. It is a huge lift for Chelsea, who have been average and a massive blow for Villa, who have looked pretty comfortable. Oh, great chance for Villa's Rudy Gestede. Probably the best of the first half. Jordan Ayew gets past his man on the left and crosses low into the box, where Gestede gets ahead of the hesitant John Terry but flicks his effort just over the bar. Terry responds at the other end with a header from a free-kick which loops over the bar. Just a flicker of life in this match. Willian does take it, but only to set up Kurt Zouma for a low shot that hammers into the wall before being cleared. Plenty to ponder for Jose Mourinho. He sits forward on his seat as Cesar Azpilicueta wins a corner. Once again, though, it comes to nothing. The ball is pinging around in the a congested middle third with little sign of control from either side. It's messy stuff. Messy and directionless. It suits Villa. Nice play from Villa allows Kieran Richardson to charge away down the left but his cross is unable to be brought down by Rudy Gestede before Chelsea hammer it away. Soon after, Jack Grealish wins a free-kick on the edge of the box after being blocked by Cesar Aspilicueta. Jordan Ayew has a pop and gets it over the wall but also the bar. It is quite flat at the moment. Villa are happy to contain and Chelsea are struggling to move the ball at the required speed to hurt the visitors. Ruben Loftus-Cheek looks the part. He is a big lad, strong and able to hold players off. He spots the movement of Diego Costa but his pass comes just a fraction too late, meaning the striker is offside instead of through on goal. A nice period of play from Chelsea, including a peach of a cross-field pass from Cesc Fabregas, almost brings a shooting chance for Willian, but a Villa man dives in to nick the ball off his toes. Soon after, Diego Costa drives to the byline and wins a corner, which Brad Guzan palms away with a host of Chelsea players waiting to pounce. Good chance for Villa as Alan Hutton gets past the stumbling Baba Rahman and draws a low save from Asmir Begovic before slamming a follow-up shot past the far post. He could have done better with the first shot, he should have done better with the second. Tell you what, it is very quiet at Stamford Bridge. This is a nervous crowd in need of a side to lift them. You can see why Villa are struggling. They have given the ball away twice in dangerous areas already. It is practically laying down the red carpet for Chelsea. Oh, Ruben Loftus-Cheek nearly gets his first start of the season off to a cracking start when his effort from inside the box - set up by Pedro - deflects wide. It brings a corner that Villa do well to head clear. Sam Payne: Great to see Mourinho giving Loftus-Cheek a game. Team needs a lift and he might give us that, like Kane did at Spurs. Now Grealish has a run, which is halted by a Ramires foul. The resulting free-kick into the box is headed away but only as far as Carlos Gil who slices a rising shot a few yards wide of the Chelsea goal. Here is Loftus-Cheek, picking up the ball from a sloppy Villa pass in midfield and driving forward, but his pass to Diego Costa is too soft and easily intercepted by Micah Richards, ending a promising attack. "I am a real fan of Jose Mourinho but when things don’t go his way he is almost like a child stamping his feet. It exasperates me. "Does any of Chelsea's bad start to the season actually have anything to do with you, Jose? Is it possible that you started pre-season so late and finished last season so early that actually, you weren't properly prepared for this campaign at all? "Because if you get your pre-season wrong then your whole season is in trouble. And Chelsea’s season is in trouble." Looks like Ruben Loftus-Cheek is sat in behind Diego Costa, with Cesc Fabregas and Ramires the two deeper central midfielders. Nice to see two young English players in him and Villa's Jack Grealish playing. It is an increasing rarity these days. Quote Message: Both sides are in some sort of disarray but what has interested me in Chelsea's case is that numerous senior players - Fabregas, Costa, Terry and Cahill among them - have publically backed their manager and admitted to their own failings. There's no suggestion Jose Mourinho has lost the dressing room. It would be ridiculous in my opinion if talk of Villa manager Tim Sherwood being a game or two from the sack is true. He kept them up after taking over in February and got them to an FA Cup final, lost his best players over the summer and has seen them replaced with inexperienced youngsters. It will be interesting to see if he relies on those players at Stamford Bridge or a more battle-hardened side. Both sides are in some sort of disarray but what has interested me in Chelsea's case is that numerous senior players - Fabregas, Costa, Terry and Cahill among them - have publically backed their manager and admitted to their own failings. There's no suggestion Jose Mourinho has lost the dressing room. It would be ridiculous in my opinion if talk of Villa manager Tim Sherwood being a game or two from the sack is true. He kept them up after taking over in February and got them to an FA Cup final, lost his best players over the summer and has seen them replaced with inexperienced youngsters. It will be interesting to see if he relies on those players at Stamford Bridge or a more battle-hardened side. The teams are in the tunnel and Stamford Bridge is filling up quickly. We'll have a game of football on our hands very shortly. "This is my first tough period in management. Once I get through this period everyone will benefit. I take a lot of heart from managers who have been through difficult periods. "We'll soldier on and get through it. I have 100% belief that we'll stay in the Premier League. "We went for a young group this season, to develop for the future. Up until the Leicester game we were doing okay but confidence dropped. We need to improve and it needs to click and it will." "One of the reasons why we paid such special attention to these two national team fixtures was to try to understand things. "What I analysed in this period was that no player was better in the national team than they are with us, so it's not their habitat which is making them play better or worse. "At this moment they are what they are, which gives me total confidence that it will be here that we will improve them and they will go back to their normality." Former Aston Villa striker Chris Sutton, who cleaned Sherwood's boots when he was an apprentice at Norwich, has been considering the Villa manager's position in his Match of the Day analysis. "There is a lot of talk that Tim Sherwood is close to being sacked by Aston Villa but I cannot understand why they would even contemplate getting rid of him at this stage of the season," said Sutton. "If he does become the next Premier League manager to lose his job, it would not just be unfair, it would be absolutely ridiculous. "I get why the club's owner Randy Lerner might be getting twitchy because of the amount of money at stake if they go down, but the logical thing to do is to give Sherwood more time because he is an intelligent man who has already shown he can improve players - which is exactly what Villa need now." Read more of Sutton's analysis here. "Don't look into the benching of Hazard too much. He is Chelsea's best player and he obviously just needs a rest. The Blues should still have more than enough to beat Villa." The BBC Sport Predictor game pits fans of Premier League clubs against each other - and both Chelsea (15th) and Aston Villa (16th) supporters are languishing in the bottom half of our table as things stand. But hang on, there are two teams playing in this game today. Aston Villa deserve some love. And boy do they need it right now. Chelsea are having a rough run, but Villa's is worse. They started with an opening day win at Bournemouth but since then have picked up just one point from seven games to leave them 18th in the table. If Jose has pressure on his shoulders right now, Tim Sherwood is Atlas. Plenty of changes for Chelsea, who have Diego Costa back up front in place of Radamel Falcao. Midfielder Ruben Loftus-Cheek is handed his first league start of the season. Eden Hazard drops to the bench, as does Oscar, allowing Pedro to come in. Baba is at full-back due to an injury to Branislav Ivanovic. Four changes for Aston Villa, Kieran Richardson is in for Jose Angel Crespo in defence, Jack Grealish, Jordan Ayew and Carlos Gil come in to midfield, with Jordan Veretout, Jordan Amavi and Scott Sinclair dropping out. Speaking of Mourinho, er, speaking, he was on Football Focus earlier today, where he discussed his trophy-laden managerial career, his family, his troubles at Chelsea this season and his tempestuous relationship with the Football Association during 16 minutes with Dan Walker. Diego Costa scored seven goals in his first four games last season and 19 overall. So far this campaign he has one in six. Midfielders Eden Hazard and Cesc Fabregas were on fire in 2014-15. A season later and they have been damp squibs. Chelsea conceded 32 goals all last season. They have conceded 17 already this campaign. John Terry and Nemanja Matic were rocks. Now, one barely plays and the other is taken off 15 minutes after coming on as a substitute. Three defeats all season vs four already. And Jose? Well, do you remember any seven-minute stream of consciousness rants in 2014-15? Back in May, we publisheda video that gave five reasons for Chelsea's title win.They were as follows: 1. Diego Costa, 2. Creativity, 3. Steel, 4. Mentality, 5. Jose Mourinho. Is it too much of a stretch to suggest that the same five reasons are at the core of why they are struggling so badly this season?